Naples Metro is much more than a transport. In fact, the Neapolitan subway is famous as one of the city’s attractions for the artworks by artists and architects that you can explore while traveling around the city. You may have heard about art stationsof Naples. The main line is the 1 with departure from Piazza Garibaldi and arrival at Piscinola. In Piazza Garibaldi there is the central station of Naples: from here you can take any national and local train. The original project is by Bruno Zevi, one of the greatest Italian architects and architecture critics. Recently, the French architect Dominique Perrault has modernized the station. Taking the subway, you can admire two works by Michelangelo Pistoletto. Anyway, you can see something from the original project by Zevi in the video of “Se telefonando” by Mina. In this station, projected by the Edyptian designer Karim Rashid, you can see an artistic project moved by the will to explore the all the words that digital era brought: network, database, software, virtual …. After University and Municipio there is the Toledo stop, probably the most famous of the art stations. In Toledo it is possible to admire the Crater de Luz, a large cone that from road level sinks to the sea one. 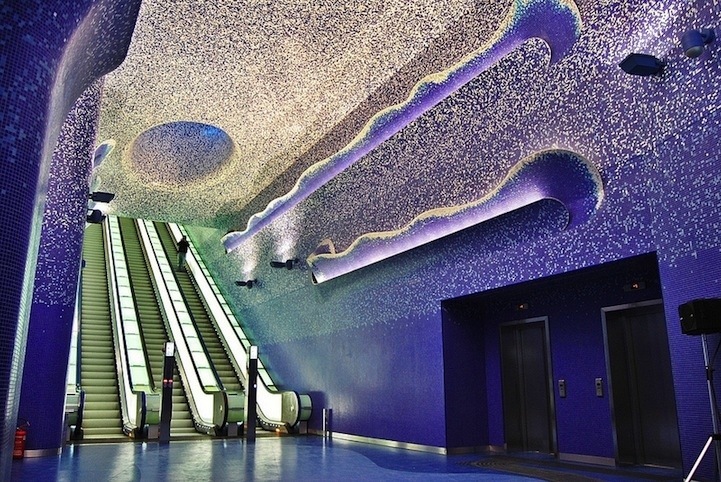 The station also houses Relative Light, the work of Robert Wilson with thousands of blue LEDs that recall the sea. In Toledo there are also the mosaics of Kentridge. This art station hosts artworks of many contemporary art masters: Carlo Alfano, Joseph Kosuth, JannisKounellis, Michelangelo Pistoletto, Nicola De Maria. Thespace is characterized by white glass panels and steel studs. This station, designed by Italian architect and designerGaeAulenti, means to be a reference to the National Archaeological Museum, next to the Museo stop – actually, Museo means Museum! Among the many artworks, the atrium of the station hosts a fiberglass model of the Ercole Farnese. In Museo you can see black and white photographs of the famous Italian photographer MimmoJodice too. Would you like to know more? Go to the part 2 of theNaples metro guide!